BassesByLeo • View topic - MusicMan have got the Stingray 5 right - at last. MusicMan have got the Stingray 5 right - at last. At last Ernie Ball have got the pick guard right on the new Classic Stingray 5. The SR4 has always looked good with the tear-drop shaped guard. The 5 looked just ugly, whatever possessed them to extend the guard down to house the controls? Re: MusicMan have got the Stingray 5 right - at last. Well, since you asked..... I hate it. I've never liked the look of most MM basses. That pickguard just looks weird to me. When I see it I think of a gourd, and think it makes the bass look like a Bouzouki or something. I guess you and I are polar opposites on this topic. I much prefer the pickguard that goes down into the control area. Actually, I think they should have just made them sans pickguards altogether like G&L L-series basses. I've seen some Ball Family Reserve models like that and they looked awesome. What?! You don't like my toilet seat? I hear what you're saying about the BFRs. There was also an anniversary SR5 HH that got a few howls of protest from the some L-2500 owners. Ken Baker wrote: What?! You don't like my toilet seat? I'm glad you said it and not me , because that's exactly what I think they look like! Hey, everything is pretty much an acquired taste. 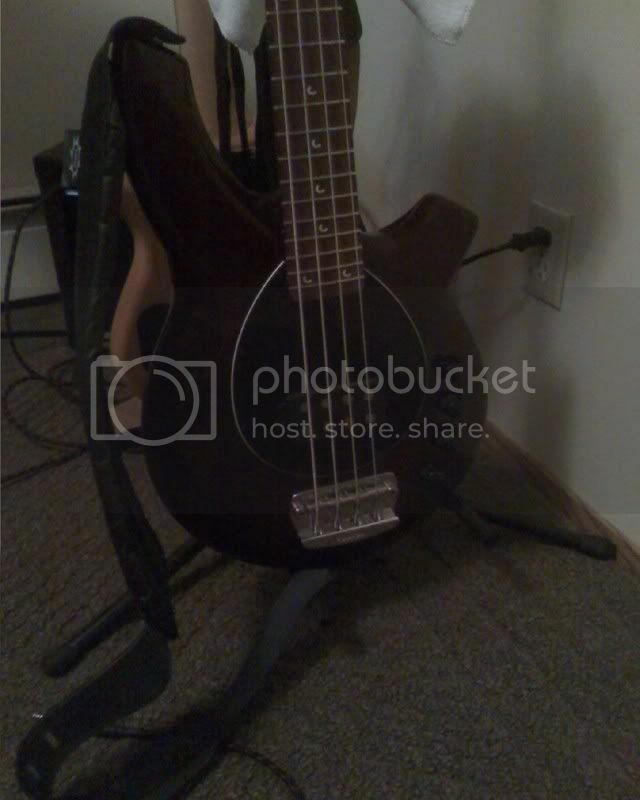 Look at the shape of the pickguard on Rickenbackers. Chris wrote: I'm glad you said it and not me , because that's exactly what I think they look like! I felt the same way about Bongo. Then I played one. Will it supplant my L-2500? No. Does it have a place here? Oh yeah. Very ergonomic, very powerful. Heh... I have enough trouble getting past the look of the body & headstock of a Ric bass, let alone the pickguard. Well I wasn't expecting to stir up a hornets nest, just goes to show you never can tell. I have been thinking of putting a tear-drop pick-gaurd and a chrome crescent control plate on my SR5 ever since I got it. I just hate the shape of the existing one and it is all black, with black knobs as well on a dark blue body. The only redeeming feature is that it is black/white/black so at least there is a bit of white on it. The down side is that it highlights that awful shape. I quite fancy an antique white pearloid one, I am a big fan of red tort but don't think it would go with dark blue. I must admit I do like the SRs without a pick-guard but mine is now full of screw holes so I don't think that is an option. It is interesting to hear how others view this somewhat emotive subject. I happen to like both designs, but prefer the oval guard. I'm real picky about the color combinations. Can't tell you how many MM products I've seen and the first thing I want to do is change the color of the guard. I actually prefer the usual SR5 guard to the teardrops. I think they look awesome. Of course, I've owned a Rolls Burgundy Bongo with a black pickguard. I can't imagine having a worse looking bass. It sounded awesome though. I can't even find a decent pic of it, lol. 1. I am out on a limb here but do I care, definitely not. 2. EB are not going to sell many Stingray Classic 5 basses. They will probably become very rare and valuable once they are withdrawn from production. I should buy up a dozen now. I don't like guards, thought I was going to replace this one with a clear guard, but it grew on me.